The PGA Championship is under way at Whistling Straits in Sheboygan, Wisconsin. Tiger Woods has a great opportunity here to make a statement in order to secure a position on the 2010 Ryder Cup team. Currently tenth on the U.S. qualifying list, Woods may even be able to sneak into the top 8 and earn an automatic berth if he finishes high enough in this tournament, which is the last qualifying event for the Ryder Cup. Fortunately I didn’t have as much riding on my performance at Monday’s Celebrity Golf Classic. 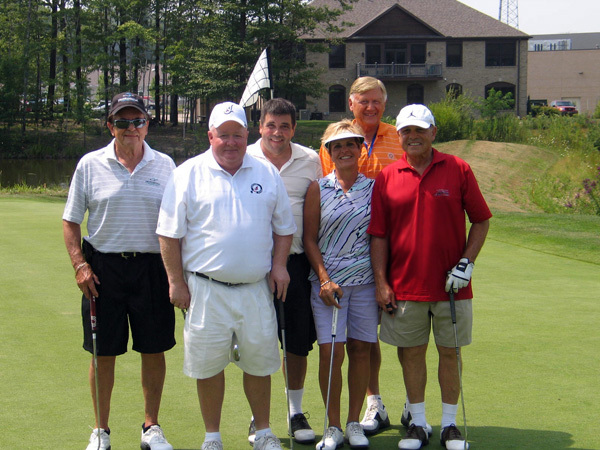 Cleveland Indians Charities hosted the 19th annual tournament to benefit their community outreach efforts. We had a great group of people, and the idyllic conditions made for a terrific day of golfing at the Quail Hollow Country Club. Among the Indians alumni who participated was MLB great Kenny Lofton, who was inducted into the Indians Hall of Fame during a pregame ceremony on Saturday. And former Indians manager Mike Hargrove was in the group right in front of me. He managed the Indians back when I was a coaching the Cavs and he’s been a great friend for many years now. Professional Travel sponsored my team. President and CEO Robert Sturm had a dozen of his employees playing on two different teams. In fact, his other team wound up winning the tournament. One of those guys sunk a spectacular hole in one and went home with a brand new Mercedes Benz. I just narrowly missed the hole in one by about 80 yards. In light of my latest adventures in golfing, looks like it may be time for me to go back to my swing coach and work on my technique. Or maybe Hargrove can help me out. He knocked the living day lights out of the golf ball. If Hargrove were still hitting baseballs like he hit the golf ball in the tournament, he’d still be playing in the Major League. I’ve used Professional travel many times and have found their knowledge and dedication to detail to be absolutly the best. Bob Sturm is an exceptional executive. I agree with you Dave Erving. Bob Sturm is an exceptional executive.